I know, I know Thanksgiving hasn’t even happened yet and I’m already decking the halls. It makes me happy to think that after spending a week with my husbands family for thanksgiving I get to come home to this instead of stressing out about holiday to-dos. So this year I decided to go with the “White Christmas” theme. I searched high and low for all of the cream, silver and glittery goodies that I used at stores like: Hobby Lobby, Dollar Tree, Target and (dare I say) garage saleing over the summer. 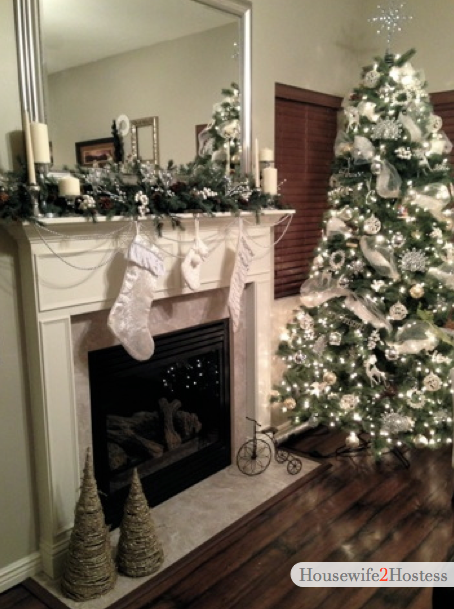 The garland over the fireplace, the peacock ornaments and all the sprigs with white berries (large and small), the cream burlap ribbon, the sheer glittery ribbon and the tree skirt(s). About those, cream or silver? I love them both like they were my children’s. Its not like I can rotate them and keep both, thats just madness! You decide America! Dollar Tree The glittery ornaments ie: wreaths, leafy orbs and reindeer. I also snagged all of the clear stemmed candle holders and tea lights. The lovely silver candle holders, candles and candle sticks. The two glittery cone trees on the floor, the small stocking and the stocking letters, the silver beads on the mantle, the stocking holders and the cream pillows. I found the two large stockings, the 3 dozen silver, gold, glitter and cream ball ornaments used on the tree. Just in case you were wondering the tree is a 7.5ft pre lit kind with the realistic type of pine branches from Costco. Yes, I love it!